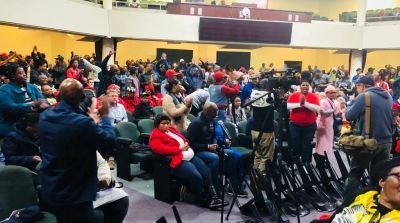 Land expropriation public hearing in Cape Town (PHOTO: The South African). The planet Earth, according to the Old Testament, is God’s conditional, covenantal gift to humankind. In the same way, the promise of the land of Canaan to the Israelites is conditional. “It is also important to note that the promise of land to the Israelites is not so much a privilege as it is a responsibility. This is truly, and inevitably, a challenge for all humankind to strive towards a peaceful coexistence and sharing of resources, including land, regardless of color, creed or language,” says L Fachhai1. As the public hearings on land expropriation wound up in Cape Town last weekend, the amendment of section 25 of South Africa’s Constitution to “explicitly” expropriate land without compensation seemed to be all but assured. 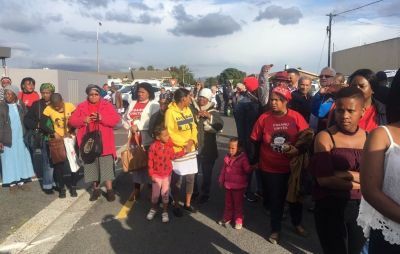 People queuing to participate in the land expropriation public hearing in Cape Town (PHOTO: Nomvuyo Xabela). Standing in the queue for almost 2-hours, waiting to enter the Goodwood hearing at Friends of God Church, I had an opportunity to question a few of the many people who were determined to go in and voice their views. Members of the public were given 3-minutes per person to make submissions to the hearing. Ashley Cloete, a Cape Town missionary and writer, said he was born in Bo-Kaap that was predominantly a Christian area at the time until they were made to leave the area. He was subsequently raised in District Six but was again forcibly moved — to Tiervlei, a smallholding (with 8 plots). He fortunately got a bursary to study in Germany, and while overseas received a letter from home informing him that a Muslim trader and businessman wanted to buy their property. He was then told his family had to vacate the area and the property was expropriated with R11 000 compensation which was not enough to buy another property. Despite all these forced removals, his family, especially his mother, continued to thank God for His care. Cloete told the hearing that in honour of his parents’ example he chose to forgive the people who had perpetrated such wicked things . He said it was better to build the future of a country on biblical values, such as love and forgiveness, rather than to take land and build the country on hatred, which would bring the country down . He said Section 25 of the constitution should not be amended as the current political structure already had safeguards to ensure orderly transition in SA. From a biblical context, it is the prerogative of kings, priests and prophets to understand the times and seasons — and, more importantly, to execute godly and just counsel to the nation, especially in times of crisis. May 14 2018 marked an end of a 70 year cycle since the adoption of apartheid as a formal policy in South Africa. At the same time Israel received its independence. • In 1885, when 1st “Aliyah” was made from Odessa, there was simultaneously a release of the Holy Spirit in Armenia and southern part of Russia. Over one-million people became Spirit filled. • Similarly the 2nd “Aliyah” in 1905 resulted in the Azuza street revival swept across the world and great ministries were born including Billy Graham. T L Osborne and Oral Roberts. • When something happens in the physical realm to Israel, it releases something in the body of Christ. • During Israel victory in the Six day war, we saw the release of the “Jesus movement” which developed into the Charismatic Revival. We call upon the most High God to remember South Africa (Africa) and judge with mercy and loving-kindness for her time of release has come. 2 — J Gunner Olson is the founder chairman of the International Christian Chamber of Commerce (ICCC), which is represented in over 80 nations. May I a correction. I was practising my 3 minute presentation while we were waiting in the queue outside. Nomvuyo recorded this and subsequently wrote the report. I was not one of those given the chance to speak in the actual hearing. Thank you Nonho for using this platform to share the message. It’s a pity Mr Cloete, that your Christian stance was not heard by those who attended the actual hearing. Hopefully many people heard you speak outside and good seed was sown. God bless you.